It's hard to believe that the 2015/16 season is coming to its close. In January last term we had a very successful “Come and Sing” when we studied some Schütz motets and the Choralpassion by Distler. These works formed the programme for the two concerts we performed before Easter. The first of these was at St John’s Church, Carrington and the second at Southwell Minster as part of the Holy Week Devotions. The Distler Choralpassion was unfamiliar to most people but the semi-staged performance with wonderful lighting effects and superb solo singing from Choir Members really heightened the dramatic and emotional content of the piece. At the end of the Easter term, our accompanist, Charles Tebbs left us. As most people will be aware, Charles has a busy teaching schedule. As well as being a composer and solo performer he felt that he needed to spend more time on these activities. He has made a valuable contribution to the Choir, both in rehearsal and in performance, and will be greatly missed. 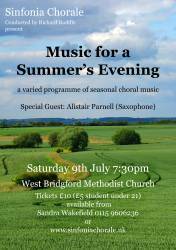 Now we have just two concerts to round off the season. Called “Music for a Summer’s Evening", the programme has a strong emphasis on pieces with words by William Shakespeare. These range from some very interesting contemporary settings by Christopher Brown and György Orbán to selections from Bernstein’s West Side Story. 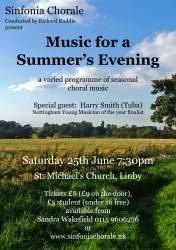 The first of these two concerts is at Linby Parish Church on June 25th at 7.30pm. 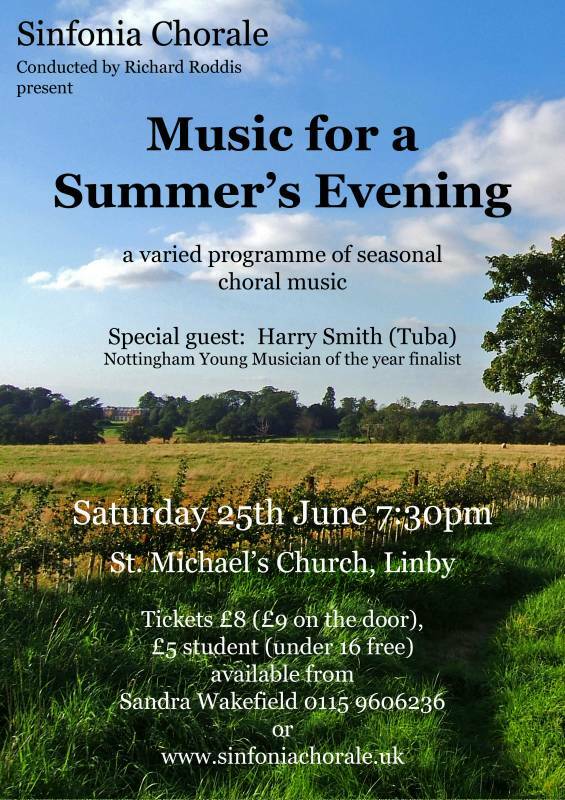 Our guest artist will be Harry Smith (tuba) who was the Brass Finalist in the 2015 Nottingham Young Musician of the Year Competition last November. Tickets for this event cost £8 or £9 if purchased on the door, £5 for students and FREE for under 16s. 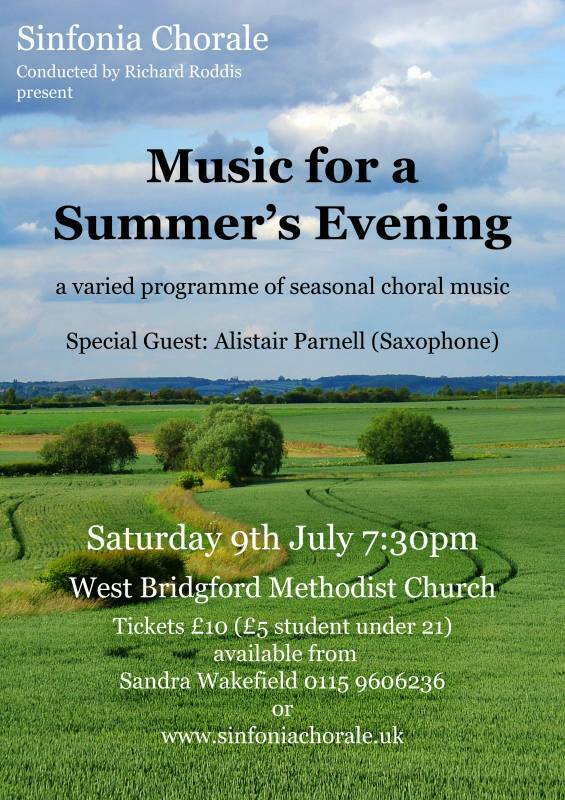 The guest artist on this occasion will be Alistair Parnell (saxophone). Tickets for this concert will be £10 and £5 for full time students under 21. When we return after the Summer break we shall begin our 50th Anniversary celebrations in earnest. We have some exciting events planned. On Saturday, January 21st 2017 we shall hold our "Come and Sing and Play". This will take place at Bramcote Parish Church and we shall be working on Bach’s Mass in B Minor which will be performed in the Southwell Minster on March 11th 2017. The details of these and other events will be posted on the website in due course. We hope you are able to come to one of our upcoming events and we thank you for your loyal support over the past season.